Malaria vector control is primarily insecticide based. It relies on indoor residual spraying (IRS) of houses and the distribution of long-lasting insecticide-treated bednets (LLINs). Only twelve insecticides from four different chemical classes (organochlorines, organophosphates, pyrethroids, and carbamates) are currently recommended by the World Health Organization (WHO) for IRS. The oldest classes of these insecticides are the organochlorines, of which dichlorodiphenyltrichloroethane (DDT) is the only approved insecticide, and the organophosphates, which are derived from phosphoric acid. Both have been used since the 1940s. All 12 insecticides collectively target two insect neurological sites. Currently, only pyrethroids are approved by the WHO for LLIN treatment. Similarly, An. funestus is the nominal member of a group of nine African species and the only one considered to be of any importance in malaria transmission. While other members of the group (An. parensis, An. vaneedeni and An. rivulorum) are either non-vectors or of very limited importance, the fact that they are easily confused with An. funestus using morphological characters means that accurate, molecular identification techniques developed in South Africa (SA)[16,17] are needed for this group, just as they are for the An. gambiae complex. Mosquitoes are incriminated in malaria transmission based on the detection of Plasmodium sporozoites by direct dissections (Fig. 1) in the salivary glands of identified females or circumsporozoite protein (CSP) detection by enzyme-linked immunosorbent assays (ELISAs) and polymerase chain reaction (PCR). Infection rates for An. funestus in SA in the past have been recorded as high as 27% in the Letsitele Valley of Limpopo Province in the 1930s while in the 1999/2000 epidemic the An. funestus infection rate was approximately 5% in northern KwaZulu-Natal (KZN) Province. 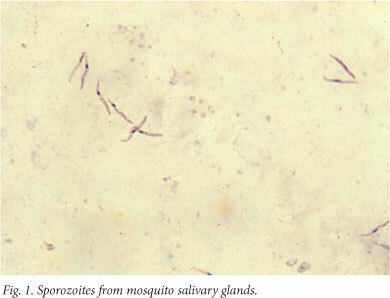 There are no recent records of Plasmodium sporozoite-positive An. arabiensis or An. merus specimens from SA; older reports are unreliable due to lack of definitive species identification. In general, very few studies have been carried out in the past 40 years on the infectivity of South African mosquito populations[20,21] (unpublished National Institute for Communicable Diseases (NICD) data, 2005 - 2012). By comparison, Table 1 gives sporozoite infection rates for the three species in the Maputo region of southern Mozambique, showing the clear impact on transmission that was achieved by the Lubombo Spatial Development Initiative (LSDI). In SA in general, An. funestus is usually associated with outbreaks and epidemics while An. arabiensis is considered largely responsible for comparatively low-level seasonal transmission in the malaria-affected regions. The study carried out by De Meillon et al. in 1977 showed that An. vaneedeni was readily infected with Plasmodium falciparum, but this species has never been implicated in malaria transmission in nature. An. arabiensis occurs in all three of SA's malaria affected provinces. It tends to prefer dry, savannah environments and generally breeds in small, sunlit, temporary, fresh-water pools. However, breeding sites can also be found along the margins of dams in cattle hoof prints as well as in rice paddies. [11,13] Adult females will feed on both cattle and humans and can be found resting both inside human habitations and outdoors. [11,13] The outdoor resting components of An. arabiensis populations are largely unaffected by IRS and are almost certainly responsible for the low-level seasonal malaria transmission experienced in SA each year. The saltwater breeding member of the An. gambiae complex, An. merus, is widespread both inland and on the coastal plains. An. funestus prefers to breed in permanent and semi-permanent fresh-water pools or slow-moving streams containing emergent vegetation. [11,13] Unlike An. arabiensis, this species is highly anthropophilic and endophilic making it especially amenable to control by IRS. Insecticide resistance in malaria vector populations is widespread. The increasing use of insecticides for malaria vector control over the past decade coupled with ongoing agricultural pesticide use has led to selection for resistance genes in a great many vector populations. Resistance to insecticides in South African malaria vector populations is a relatively recent occurrence. The first documented tests for insecticide susceptibility in local malaria vectors took place in 1978 (unpublished newsletters of the National Institute for Tropical Diseases, 1978 - 1980) with no resistance reported. No further tests were carried out until those described by Gericke et al. Samples of An. arabiensis were collected in 1996 from Thomo and Malahlapanga in Limpopo Province and Mamfene in KZN. They were assayed against DDT, deltamethrin, fenitrothion and propoxur using the standard WHO bioassay technique for testing the susceptibility of adult anopheline mosquitoes. In these tests, the Malahlapanga population was used as a control population from an insecticide-free area (Kruger National Park), against which the populations from Mamfene and Thomo were assessed, both of which are located in areas that, at that time, had experienced insecticide use either for agricultural and public health purposes (Thomo) or for public health only (Mamfene). All populations showed full susceptibility to DDT, deltamethrin and fenitrothion. The Malahlapanga and Mamfene populations also proved fully susceptible to propoxur whereas the Thomo population showed evidence of propoxur resistance. In response to the South African malaria epidemic that peaked in 2000, samples of anopheline mosquitoes were collected from the Ndumu region of northern KZN during 1999. These samples were primarily collected in window exit traps or by pyrethrum spray catches. Male anophelines, morphologically identified as members of the An. funestus group, that had been collected live in the window traps, were assessed for their susceptibility to permethrin in the field using a bottle bioassay. The progeny of wild-caught females, also identified as An. funestus group, were assayed under laboratory conditions for permethrin resistance using the bottle bioassay as well as the standard WHO method. Species identification of the wild mosquitoes used the new molecular method of Koekemoer et al.The insecticide bioassays revealed high levels of permethrin resistance in An. funestus but full susceptibility to DDT (Table 2). Samples of the closely related species An. rivulorum and An. parensis from the same collections gave no indication of resistance to permethrin. Subsequently, more substantial collections of An. funestus were carried out in 2000 from the Beluluane region of southern Mozambique. Resistance to the pyrethroids deltamethrin and lambda-cyhalothrin was demonstrated. Furthermore, resistance to propoxur was detected while full susceptibility to DDT was confirmed. It has since been established that southern African An. funestus are fully susceptible to the pyrrole insecticide chlorfenapyr regardless of their resistance status to pyrethroids. Samples of An. arabiensis and An. merus from the Beluluane region of southern Mozambique, collected in 2000, did not show any indication of resistance to pyrethroids (deltamethrin and lambda-cyhalothrin), DDT, carbamates (propoxur and bendiocarb) or the organophosphate fenitrothion. However, collections of An. arabiensis in 2002 from northern KZN revealed resistance to DDT, but full susceptibility to deltamethrin. Subsequent collections in Mamfene during 2005 revealed resistance to permethrin and suspected resistance to deltamethrin. At the same time, resistance to deltamethrin was also recorded in the non-vector species An. parensis from Mamfene. Pyrethroid resistance in the wild population of An. arabiensis from Mamfene is also primarily based on monooxygenase detoxification. [21,41] Microarray analysis of a DDT and pyrethroid-resistant laboratory colony, which was established using wild-caught material from Mamfene, revealed over-transcription of 20 genes associated with the DDT/pyrethroid resistance phenotype. Most of these genes are monooxygenases and glutathione s-transferases. It is interesting to note that although no knockdown resistance (kdr) mutations have ever been recorded in wild An. arabiensis from Mamfene, including the most recent sample (n=100) collected in 2012 (unpublished data, NICD), the laboratory colony on which these studies are based and which has been intensively selected for resistance to DDT, is now fixed for the L1014F kdr mutation. Association analyses revealed that DDT and permethrin resistance in this laboratory colony is closely linked to the L1014F mutation while deltamethrin resistance is primarily based on enzyme detoxification. The occurrence of insecticide resistance in malaria vector populations in SA necessitates the design of tailored strategies by region/province to manage resistance and thereby maintain vector control programme efficacy. As insecticide resistance has been detected in vector populations in nearly two-thirds of those countries experiencing ongoing malaria transmission, a Global Plan for Insecticide Resistance Management (GPIRM) has been developed by the WHO. This plan lists several strategies for IRM including rotations of insecticides, mosaic insecticide spraying and combinations of interventions. These are designed to preserve the efficacy of those insecticides available for public health use either by circumventing the development of resistance in target populations or by slowing the spread of resistance where it already occurs. These strategies can easily be incorporated into those programmes, based on an integrated vector management approach. Record-keeping systems are in place to record all IRS activities. These consist of 'hutcards' that are completed at each sprayed dwelling. Pertinent information including date, insecticide used and spray operator's details are recorded on each hutcard. This card remains with the householder for future monitoring and record purposes. The daily performance of spray operators is also recorded, with spray data entered into electronic information systems. The IRS programmes are fully funded out of each respective provincial Health Department's budget. The annual budget for malaria control at provincial level currently ranges from R35 million to R88 million depending on province and vector control accounts for about 70% of the provincial malaria budgets in any given year. Growth of communities in endemic areas exceeds the capacity of the malaria spray teams. Dwellings have become more sophisticated with extensive furnishings that inadvertently provide more vector mosquito resting sites. High IRS coverage is difficult to achieve in such dwellings. The deposits left on walls by DDT are also not always accepted by communities. The introduction of the highly effective public health insecticide, DDT, shortly after the end of World War II, allowed the malaria control programme to greatly expand its activities and dramatically reduce the burden of disease. 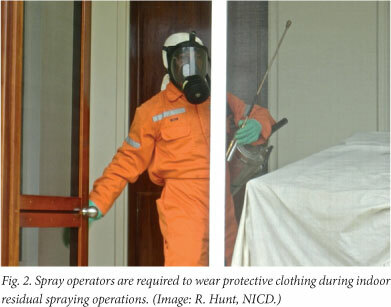 Given that much of the cost of a malaria control spraying programme is for labour and logistics, the fact that DDT remains effective for the whole transmission season meant that households could be protected with just one spray round per year. As a result of the expansion of the spray programme, malaria, which historically occurred as far south as Port St Johns and as far inland as Pretoria, was pushed back to the north-eastern Lowveld areas bordering Mozambique and Zimbabwe. Since the 1960s, DDT has been receiving progressively more attention from various lobby groups with respect to its harmful effects on humans and the environment, often based on suspect data. In 2000, at the height of SA's malaria epidemic, the Stockholm Convention on Persistent Organic Pollutants (POPs) held its fifth and final negotiating committee meeting in Johannesburg. The South African government, along with the assistance of international scientists and an independent advocacy group, managed to secure an exemption for those countries wishing to use DDT for malaria vector control purposes. Currently, the SC acknowledges that there is an ongoing need for DDT and allows its use for vector control according to strict guidelines drawn up by the WHO. [47,48] Countries that wish to use DDT are required to register with the Convention Secretariat and report back on a regular basis as to quantities of DDT used and what research has been undertaken to investigate equally effective, safe and affordable alternatives. To this end, some countries are being supported by the Global Environment Facility to carry out integrated vector management with the aim of reducing reliance on DDT. In the meantime, DDT remains an important insecticide in the arsenal of public health insecticides for malaria vector control. The WHO has recently recommended that routine insecticide susceptibility monitoring and evaluation should be supervised by a qualified entomologist with at least an MSc degree in entomology. There is currently a shortage of trained entomologists on the African continent, including SA. It is important to note that this role cannot be adequately performed by field technologists or technicians as their skills lie in a different area and are not sufficiently specialised to include entomological surveillance.